Google recently announced the Angular2 beta for public download. This has many developers excited to finally move onto the next phase of Angular development. New devs are also getting curious to learn exactly how Angular works. Since this new Angular2 release is completely different than Angular 1, it requires a trashing a good majority of AngularJS coding principles. For existing developers this is rather annoying, but new developers should be excited to launch into a powerful JS framework for web development. The lingering question is how should one get started learning? Since Angular2 is still in beta the docs haven’t been fully updated. However they have been updated enough to let devs join in on the action and start writing about Angular2 changes. If you’re hoping to learn AngularJS then you’ve started at just the right time. The following resources are perfect for learning Angular2 from scratch or even re-learning Angular if needed. In time I’m sure more resources will be published with greater depth and clarity. But for now the v2 beta offers enough info to learn TypeScript and the fundamentals of AngularJS application architecture. 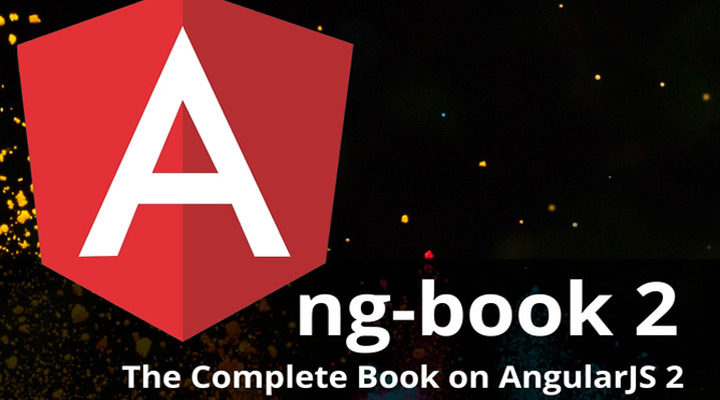 Commonly referred to as the ng-book written by 20-year developer Ari Lerner for the AngularJS community. It’s available in both eBook and print via Amazon. In this book Ari explains the best practices you should be using in Angular2 development. You’ll find real-world examples with source code explaining how they operate and what makes them compliant with Angular best practices. The original ng-book is still very popular – although by now it’s almost completely outdated. Instead check out his ng-book 2 which focuses entirely on the Angular2 rewrite. Contents include binding data to components, TypeScript, writing forms, APIs, routing, and so much more. Best of all Ari consistently updates his book with the latest Angular coding standards so you’ll never be out of date. If you’re someone who prefers the printed page then you’ll definitely want to check out Ari’s new book. Visit the ng-book 2 website to find more details, FAQs, and customer testimonials. Classic Angular devs might also consider Switching to Angular 2 written by Minko Gechev. This is a newer book geared towards teaching existing Angular devs how to make the jump into Angular 2 territory. Another option for book lovers(print or Kindle) is Angular 2 Essentials by Pablo Deeleman. Often the best way to learn anything is to go right to the source. The AngularJS website has great info about Angular2 and the newest changes. But I also recognize that some developers can be intimidated by documentation – especially when they’re new to writing code. The AngularJS docs are perfect for veteran coders or developers who already understand many fundamental principles of application development. They have a 5-min quickstart guide explaining Angular file structure and environment setup process. 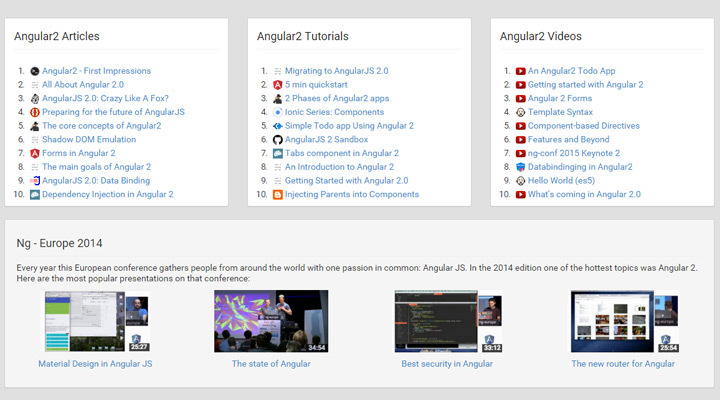 They also have a cheatsheet and collated Angular resources. 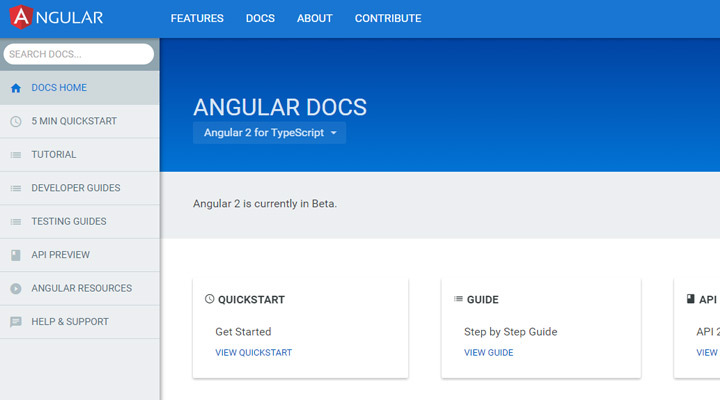 If you have the mettle and drive to learn on your own the Angular’s official site is perhaps the best place to get started. Alternatively check out the other resources in this post for an easier introduction to Angular2 development. Egghead is an eLearning website offering both free and premium courses. The content includes written posts and hundreds of video screencasts across many languages & frameworks like Node.js, React, and of course Angular2. It seems Egghead is one of the few online learning resources that’s willing to cover Angular2 app development in-detail. At the time of this writing Egghead offers 29 different Angular2 screencasts with only 3 of them being premium. This means you can watch 26 Angular2 screencasts for free in Egghead’s current library. It’s worth getting a head start on the subject with as much free material as possible. Check out Egghead’s Angular2 page for screencasts covering all the basics through Angular Pipes and ES5/ES6 syntax. Let’s be real: there’s a lot of crap on YouTube. But there’s also a lot of incredible material out there for free if you know how to find it. Angular2 beta is still fresh off the printing press but has been on the radar for months. The Angular community has put together a number of great video tutorials for learning Angular2 from scratch. If you’re more of a visual learner and don’t want to pay any money then hit up YouTube and see what you can find. And you might also check out this free course hosted on Coursetro. 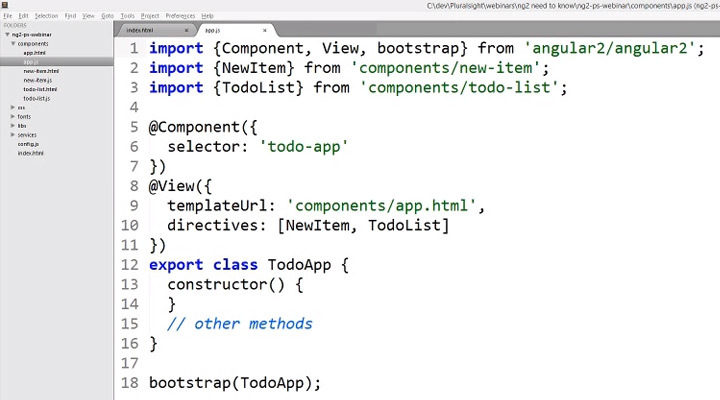 It covers all the basics of Angular 2 wrapped up into a 2-hour long video series. If none of these resources cut the mustard then I recommend using online lists of curated resources. My favorite is Angular2 Learning broken down into mediums like books/videos and subject matter like authentication or routing. The GitHub page is maintained by Jeff Cunningham with a direct focus on Angular2 learning resources. It was originally created for Angular 1.x but has since moved on to cover the latest Angular2 code. Another free curated list is Angular Education also hosted on GitHub. This list is organized more by subject matter which has links to both videos and written articles. It’s updated frequently with new material like Angular 2 by Ninja Squad, and upcoming books like Angular 2 in Action currently scheduled for early 2017. Both repos are fantastic and worth bookmarking if you’re serious about learning Angular2. One other website worth visiting is Angular2.com. It’s a haven of free learning resources with the latest Angular2 articles/tutorials and videos from around the web. While this website serves as a curated list of content, another site Learn Angular2.com actually publishes their own tutorials. Written content can be outdated so it’s important to check sources. But written content is also the easiest to find and follow along with at your computer. These are some of the best curated Angular2 lists that I’ve found, but stay on the lookout for similar resources as we near an official Angular2 public release date. The social news site Reddit is full of knowledgeable programmers. So it’s no surprise to find a dedicated Angular2 community made for solving problems and asking questions about this new version of AngularJS. The community is still fairly small with only about 1k subscribers. But over time it’s fair to assume this number will skyrocket – especially after the official Angular2 release. 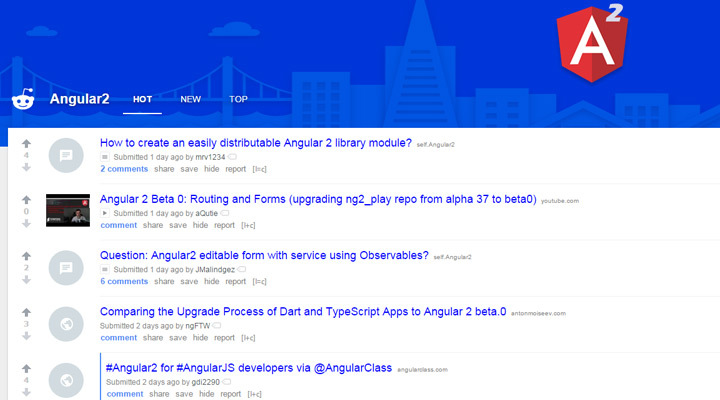 Everyone on /r/Angular2 comes together for support and encouragement. Ask questions, answer questions, post resources, or just save anything that seems interesting. Reddit is one of the best sites to find obscure answers to questions that you may not know how to solve. Another relevant Q&A-style resource is Stack Overflow. Feel free to browse their ‘angular2’ tag for relevant questions about the Angular library. The best way to learn is by building stuff and solving problems, so don’t be afraid to ask for help whenever you need it. 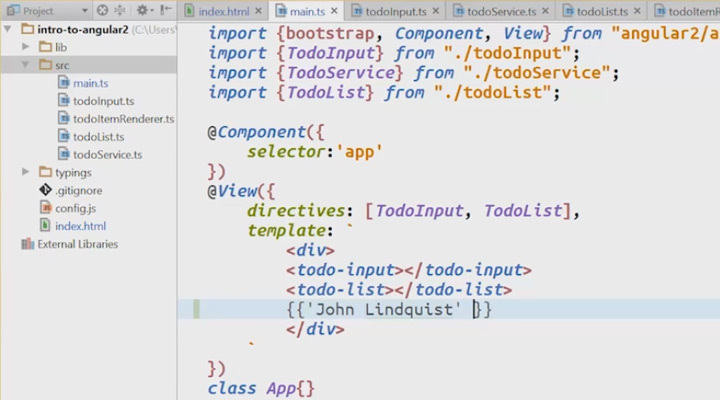 In its current state Angular2 is a mix of new features with legacy content. It’s difficult to tell what will remain once the dust settles – but for now there’s plenty of info to start learning the basics of Angular app development. Hopefully these resources can put you on the right track and build some excitement for Angular2 development. There is no official public release date for Angular 2.0 but the team at Google is working hard to push a quality bug-free release as soon as possible.